We're committed to protecting and respecting the privacy of our website visitors. The following policy details how we collect and treat your personal information. 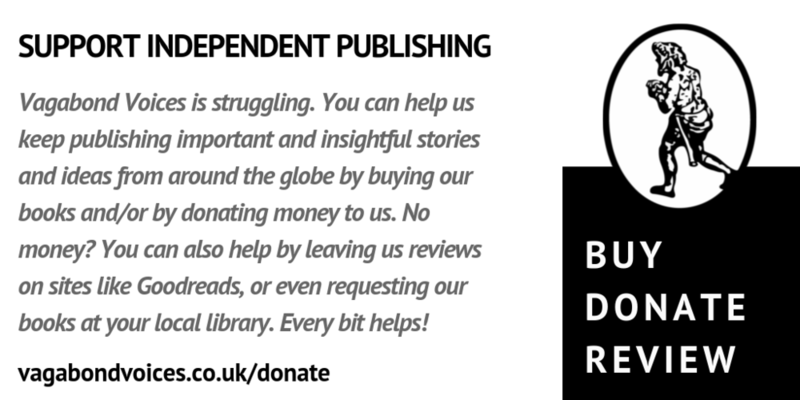 Vagabond Voices is an independent Glasgow-based publisher of literary titles in English and translation. For more information about us, please visit our Contact page. - information about how you use our website: this includes your IP address, geographical location, browser and device types, referral source, the length of your visit and the pages you've viewed. We access this information via SquareSpace's in-built Analytics as well as via Google Analytics. Our purpose in monitoring this information is to gauge reception of our site – particularly when we've changed something on it (for example, done a redesign), or added new content. Knowing which content most interests people helps us tailor our output to our readers' tastes. - information relating to any transactions between you and us made on this website or through our online payment processor, Stripe. This includes your name, address and the product(s) you wish to purchase. The information remains in our secure databases on Squarespace and Stripe. We do not use this information for anything other than to process orders (including payments and refunds). Squarespace uses a variety of cookies, to see a complete list of them, please click here. During your visit to our site we may use both "session" and "persistent" cookies. Session cookies do things like storing the state of your cart while you're paying in Stripe. These are deleted once your payment has been processed (i.e. once your "session" is closed). Persistent cookies are longer-lasting – for example, they help our site recognise a return visitor and prevent repeat pop-up messages. At some point they will expire on their own, but it's more likely that you'll end up deleting them yourself if you regularly choose to delete cookies whilst clearing your cache. Any personal data you submit on this website will be used for the purposes specified in this policy and/or on other relevant pages of this site. - we process online payments through Stripe. We share information with Stripe solely in order to process payments made on our website. We do not provide user information to third parties for any purposes other than to process payments (Stripe) and to produce statistical reports that help us better tailor our content to our readers' interests (Google Analytics, Squarespace Analytics). We do not provide user information to any third parties for marketing purposes. If you subscribe to our newsletter, we will store your email address and name (if you've provided it) on MailChimp, which also tracks user data – for example, how many people have opened any given newsletter, how many people have clicked on links in our newsletter etc. If you no longer wish to receive our newsletter, you can easily unsubscribe by clicking the "unsubscribe" link in the newsletter itself, or by contacting us at info@vagabondvoices.co.uk. Except as disclosed in this policy, we will not provide your information to third parties. It is important to acknowledge that data transmission over the Internet can never be 100% secure. As such, we are unable to guarantee that information you send us online will never be compromised. However, we do guarantee that we'll take every precaution within our power to prevent the loss, misuse or alteration of your personal information. We store your details on a secure server and use SSL-encrypted emails. If you ever receive a suspicious email from us, please get in touch with us directly rather than by replying to the suspicious email. We will never ask you for your credit card details via email, for example. You have a right to request that we send you any personal information that we hold about you. If you subscribe to our newsletter, you can unsubscribe at any time by clicking on the "unsubscribe" link at the bottom of our newsletter or by getting in touch with us directly via email or phone. If you wish to update or correct any of the personal information that we hold about you, please contact us. Vagabond Voices is the data controller of this website.